This recipe is from the All-Star Thanksgiving 2004 show on FoodTV demonstrated by Tyler Florence. Getting the flesh of the artichoke is a lot of work, so a Filipino father is necessary, but it’s also a wonderful Thanksgiving dish that doesn’t involve any turkey. 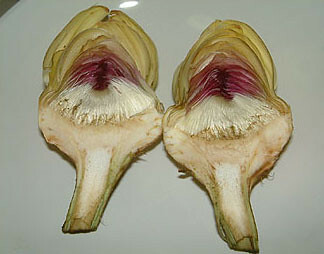 Your artichokes should look like this after trimming them to expose the light green flesh. The white hairs and the pink leaves should be scooped out and discarded after simmering in the flavorful broth. They are easier and cleaner to remove cooked than raw. You need 8 artichokes for this recipe to have enough by the time you clean them out. 1. Bring the flavorful broth to a simmer in a large pot. Add the artichokes, cover the pot over medium heat for a little less than 20 minutes, until there is no resistance when a knife is inserted into the base of the artichokes. 2. Spoon out the artichokes carefully and try to leave the halves intact for a better presentation. Carefully scoop out the hairy choke from the center and discard. 3. 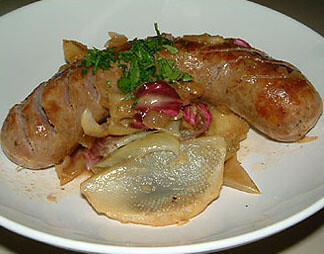 In a hot, deep skillet, pour some olive oil and brown and cook the sausages for about 10 minutes. Remove and set aside. Using the same skillet, add a drizzle of olive oil to the pan and cook the sage leaves until fragrant. Add shallots, garlic and lemon slices and cook for another 2 minutes. Add chicken stock, bring to a simmer and emulsify with butter and a little bit more oil until reduced and thickened. 4. 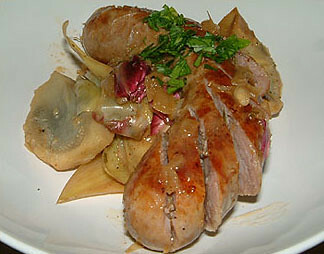 Return artichokes and sausages in the pan and cook over low heat for a few minutes to warm them up. Spoon out and serve by topping with leftover parsley.